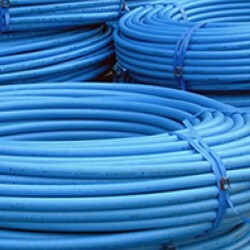 We offer an extensive range of Water Service and gas pipes in 25mm and 32mm diameter in 25mm, 50mm and 100mm coils. Use just one pic of blue coil and yellow coil. A potable water pressure pipe system.Corrosion resistanceFlexibility, allowing for ground movementSu..
32mm diameterPotable Water Pressure Pipe SystemBluePolyethylene PE80MDPEAVAILABLE SIZESMDPE BLUE 32M..
SAFETY NOTE: Pipe is held in coils under tension and is strapped accordingly. Please refer to guidan..